The U.S. and Cuba on Monday formally restored diplomatic relations amid lingering concerns over the island’s human rights record that includes the harassment of independent LGBT rights advocates. Secretary of State John Kerry told reporters during a press conference at the State Department that he and Cuban Foreign Minister Bruno Rodríguez Parrilla spoke about human rights and other issues of “mutual concern” during their meeting that took place hours after the two countries formally restored diplomatic relations. Rodríguez acknowledged these differences as he spoke to reporters in both English and Spanish. Rodríguez during the press conference reiterated several times in both English and Spanish the Cuban government’s demands that the U.S. end its decades-long embargo against his country and close the Guantanamo Bay Naval Base. Rodríguez and Assistant U.S. Secretary of State Roberta Jacobson were among the Cuban and American officials who attended a ceremony at the Cuban Embassy on 16th Street, N.W., in Northwest Washington earlier on Monday during which the Cuban flag was raised. Many of those who gathered in front of the building chanted “Cuba yes, Castro no” and “Cuba without Castro” as guards hoisted the Cuban flag. 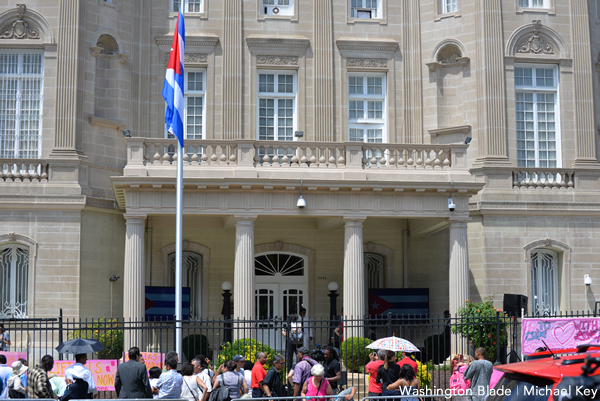 A State Department employee earlier on Monday placed the Cuban flag inside the building’s lobby. Kerry is scheduled to travel to the U.S. Embassy in Havana on Aug. 14 where he will oversee the raising of the American flag. Critics of the normalization of relations between the U.S. and Cuba contend the Cuban government has done little to improve its human rights record since President Obama announced the move last December. 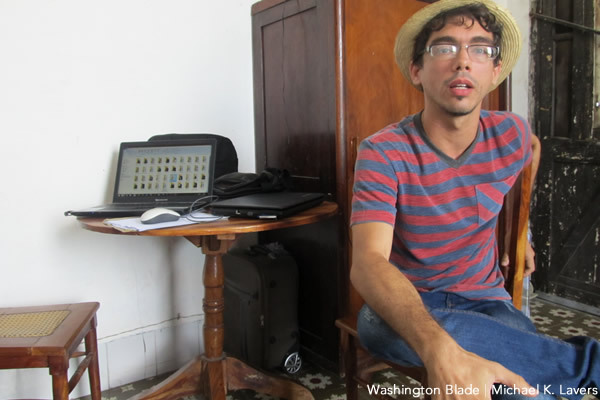 Three Cuban advocates who work independently of the National Center for Sexual Education, an organization that spearheads a number of LGBT-specific initiatives on the island, earlier this month claimed authorities at Havana’s international airport harassed them and confiscated their cameras and USB cards as they returned from Colombia where they had attended a human rights workshop. The organizer of an independent LGBT Pride march that took place late last month in the Cuban capital said authorities prevented him from leaving the area around his home as he tried to travel to the event. Independent LGBT rights advocates with whom the Blade spoke in Cuba in May largely shared this view. U.S. Rep. Ileana Ros-Lehtinen (R-Fla.), a Cuban-born Republican who champions LGBT-specific issues in the U.S. House of Representatives, is among those who also blasted the Obama administration on Monday. Democratic National Committee Chair Debbie Wasserman-Schultz, who represents portions of Florida’s Broward and Miami-Dade Counties in the U.S. House of Representatives, earlier this month cited Cuba’s “horrendous” human rights record when she said the Obama administration’s efforts to normalize relations with the Communist island should slow down. Gay New York Congressman Sean Patrick Maloney in June voted against a resolution that would have lifted travel restrictions to Cuba. Cuban advocates who support the Castro government and the National Center for Sexual Education that Mariela Castro Espín, daughter of Cuban President Raúl Castro directs, were quick to welcome closer ties between their country and the U.S.
Francisco Rodríguez Cruz, a gay Cuban journalist and LGBT rights advocate, told the Blade on Sunday that the full normalization of relations between the two countries will only occur when the U.S. lifts its decades-long embargo against the island. He nevertheless said he feels closer ties between Washington and Havana will benefit LGBT people in both countries. “Better communication between our people can contribute to increased visibility of forces and results of both countries in the fight with respect to the freedom of sexual orientation and gender identity,” Francisco Rodríguez told the Blade. Victor Hugo Robles, a Chilean LGBT rights advocate who calls himself “Che de los Gays,” agreed. He further noted to the Blade that closer ties will prompt the Obama administration to lift what he described as the “incomprehensible, criminal and inhumane” U.S. embargo against Cuba. “The Cuban people are in charge of their history, past, present and future,” he said.